Lie on a bench and position the barbell above your forehead by pressing the weight upward (much as you would if doing a bench press, except with this exercise the weight is maintained over your head or behind it so that constant stress is placed on the muscles). From the aforementioned starting position, lower the barbell behind your head in a smooth arc, inhaling throughout the movement. Your arms should remain mostly straight throughout the lift. Raise the barbell, once again in a smooth arc, until it is above your face, exhaling throughout the movement. 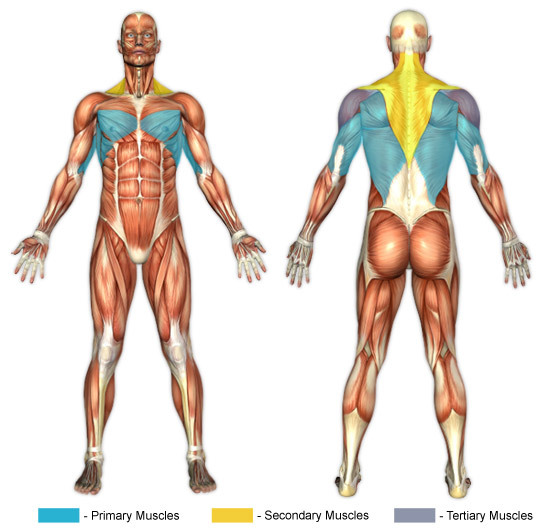 Pullovers are unique in that they allow for thorax (rib cage) expansion better than basically any other exercise. To expand the rib cage with this exercise, it's ideal to lie across a bench differently than the usual fashion; instead of lying long-way across the bench, place your shoulders on the bench pad forming a "T" shape with your body and the bench. In this manner, you can drop your hips lower than your shoulder girdle and get the proper, full stretch and thus maximum expansion benefits . In addition, to achieve rib cage expansion, it's especially important that your arms remain mostly straight throughout the lift--slight elbow bending is acceptable at the bottom of the motion to ensure that an optimal stretch is being achieved. Due to the positioning of the barbell for this exercise--that being over your forehead--it is especially important to choose only a weight which can be very comfortably managed. If your arms buckle from exhaustion the weight could end up falling on your face.